The knowledge we have gained in the course of the Autism&Uni project and the final end products have been presented at two international conferences in January and March. While the two events targeted rather different audiences, both had participants who expressed interest in our results. As we have seen happen in partner countries, educators and autistic students of different ages were keen to discuss their experiences, giving the impression that up-to-date information and tools are welcomed by everyone working with these issues. The World Autism Organisation (WAO) conference in Denmark brought together people with a specific interest in autism: parents, professionals, and a few autistic adults. 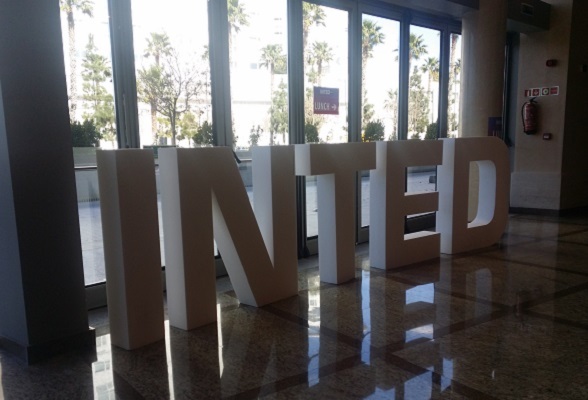 The International Technology, Education and Development Conference (INTED) in Spain, the final and main event for the presentation of the project’s results, had a broader educational focus. The responses to Autism&Uni were similar in that we were approached by professionals working in education at both events, but in Denmark there was more focus on special education while in Spain the discussions were more about autistic students in mainstream settings. Image: Antti Aavikko introduces the Best Practice Guide to INTED participants. While our workshop attracted a relatively small proportion of the 650 participants, our stand was very busy and we quickly ran out of printed copies of our Best Practice Guide. At this point, the Best Practice Guide is the output that has generated the greatest amount of interest. Translation to Danish was requested in Denmark, and printed copies of the English version were very popular at the INTED conference. The end of the project feels very much like a beginning as we encounter people who are just finding out about solutions described in the Guide, considering ways to apply them in different environments. No doubt the range of adjustments and services we have described will expand in years to come as awareness grows in one European country after another. 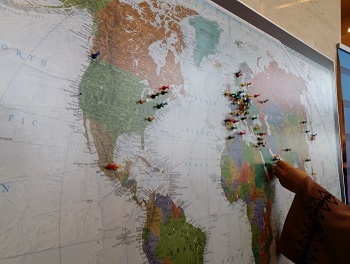 Image: The need for more information and tools to support autistic students was expressed by conference participants from numerous countries across the world. Comments from INTED participants taught us a few things about the world beyond Europe. There is a great variety of approaches to supporting autistic students still unknown to us, influenced by cultural factors, and there is also interest in learning from what we have accomplished. 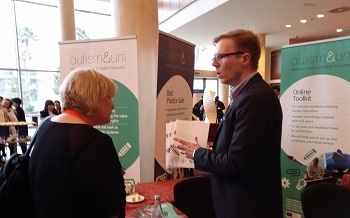 Similarly to Denmark, one of the most common requests heard at our conference stand, coming from participants representing numerous countries on several continents, was that of having the Autism&Uni end products translated to other languages. Some of the perspectives expressed by participants from other parts of the world were slightly surprising from the European viewpoint. In Japan, for example, advocacy is not as self-evident as a concept and a part of good practice as it is for us. There may be great reluctance to talk about the autistic student’s special needs. In such contexts, web-based tools that are available to all students could be even more necessary and influential in empowering students than they are in Europe. Image: Dr Marc Fabri (right) discussed the Autism&Uni project with Dr Stephen Shore, Professor of Special Education, at the World Autism Organization conference. Interesting discussions with individual professionals pointed potential ways forward, as well. 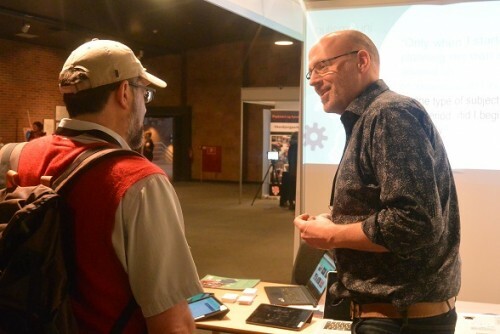 At the WAO conference in Denmark we talked to Dr Stephen Shore from Adelphi University, New York, widely known for his international presentations on both his academic work and the effects of autism in his own life. Dr Shore’s research interests coincide quite closely with certain areas of our project. He has observed that his students on the autism spectrum commonly have narrower, more intense learning preferences than most people in terms of the sensory modalities used for learning. Additionally, he does not subscribe to the view of them necessarily as primarily visual learners or visually oriented. Such insights could contribute to further development of the Autism&Uni toolkit, intended to detect users’ preferences, as it enters the real-life test of becoming part of daily practice at Leeds Beckett University and Eindhoven Technical University. The INTED conference papers by Autism&Uni Project Partners are available in the Publications section of this website, and they will be published in INTED2016 Proceedings.